Non-intrusive super/subscripts using slanted Greek with tensor? I was quite happy with how the tensor package is able to typeset beautiful tensor expressions … until I decided to use the ISO convention for my Christoffel symbols. As shown in the picture, direct use of \indices leads to “intrusive” \sigma into the space under \mu (or, “intrusive” \mu into the space above \sigma), which is understandably caused by the slanted \Gamma. 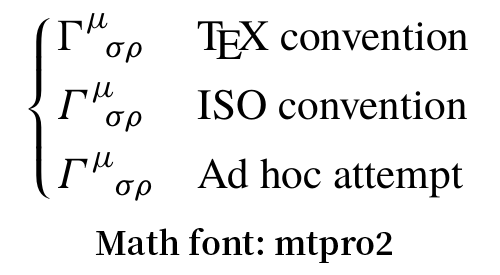 When switching from the TeX convention to the ISO convention, I’d like my tensor super/subscripts to be non-intrusive. Is there anything I can do/modify so I don’t have to manually change every \indices using the “ad hoc” approach? Browse other questions tagged subscripts superscripts tensor or ask your own question. How to put multiple non math subscripts?